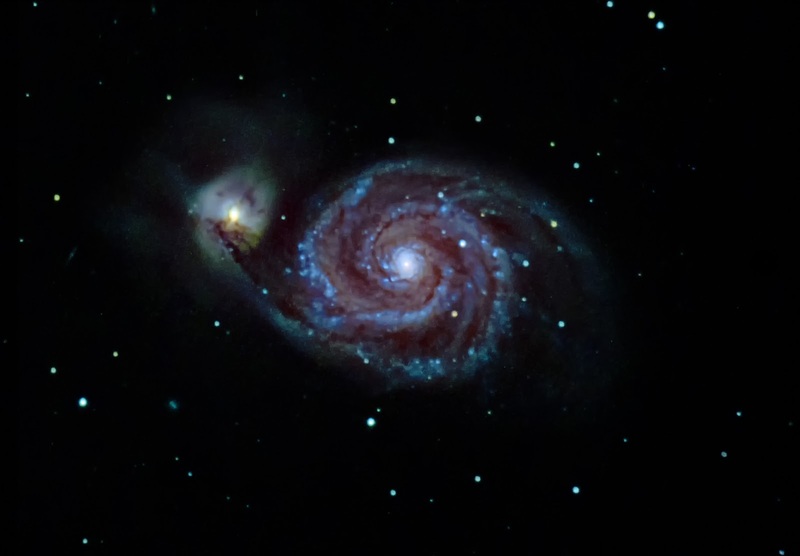 M51 (The Whirlpool Galaxy) is a spiral galaxy interacting with a smaller dwarf galaxy both located approximately 25 million light years away in the constellation Canes Venatici. It was the first galaxy to be classified as a spiral galaxy. Imaged with a Nikon D750 attached to the Orion Optics ODK12 Reflector at the society observatory. Auto-guiding was done with Rhys' guide camera attached to the Takahashi. 20 x 180s and 4 x 300s both at ISO 800 were taken, stacked and processed independently, then blended with further noise reduction applied. Lightroom, Nebulosity and Photoshop (plugins: NC Astro Tools, AstroFlat Pro, Raya Pro 3.0, Nik DeFine 2) were used.